Write the book on whatever you do, but don't ever be afraid to throw that book away and write a new one. Eric started his career designing architectural millwork, furniture and cabinetry. After many years working for wood shops and cabinetry showrooms he founded SketchThis.net with the goal of making it easier for designers to use technology in their businesses. 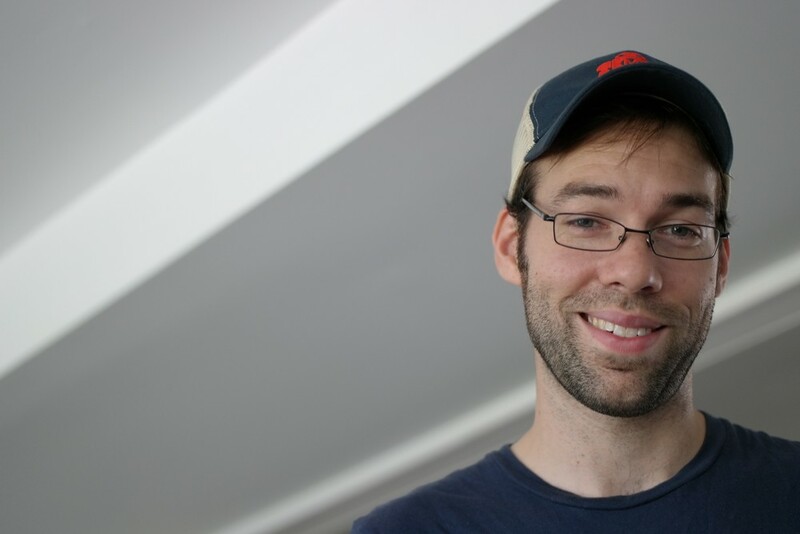 He has worked with Google and Trimble on the development of Sketchup, and traveled the country teaching Sketchup and digital fabrication to countless students. Eric also has an intense passion for digital fabrication and “making”. He uses and teaches 3D printing and CNC fabrication. He has helped design and build digitally fabricated homes, geodesic domes, and many other cutting edge projects. His company, SketchThis.NET, also developed and launched a kitchen design plugin for Sketchup. This plugin is a cloud service that plugs directly into Sketchup and provides a rich catalog of cabinetry and interior components. Designing kitchens and interiors used to take hours; this plugin can do complex jobs in minutes. He is also a regular columnist for Kitchen & Bath Design News, MAKE Magazine, he teaches Sketchup nationally, and speaks on emerging technologies for the design field. He is currently touring the country on a three year "Art and Science" teaching tour with Jennifer Gilmer and Kitchen & Bath Design News. Eric helped design and build a open sourced plywood house for Maker Faire 2014. This epic 3 day build tool 160 sheets of plywood and about 15 people to complete. Eric was tasked with creating the largest structure possible in the shortest amount of time with a minimal amount of material. In a matter of weeks he produced two of these 20' geodesic domes made from hardware store PVC pipe. These were featured at Maker Faire and one of Make Magazines most popular articles at the time. Eric was asked to create an eye catching feature for a trade show. A 9 foot tall dinosaur fit the bill. This was fabricated to not only be huge, but also transportable. Collaborating with an electrical engineer the jaws were also made to be animatronic. Eric designed this bench to be open source and hackable. When presented to the SketchUp community, users "hacked" it for many different uses. Eric took all of the hacks and made them a reality in his shop. Ever since getting his first MakerBot in 2009 Eric has been obsessed with 3D printing. Recently he 3D printed a foosball table. Eric was tasked with making an interesting and engaging game for a trade show booth. 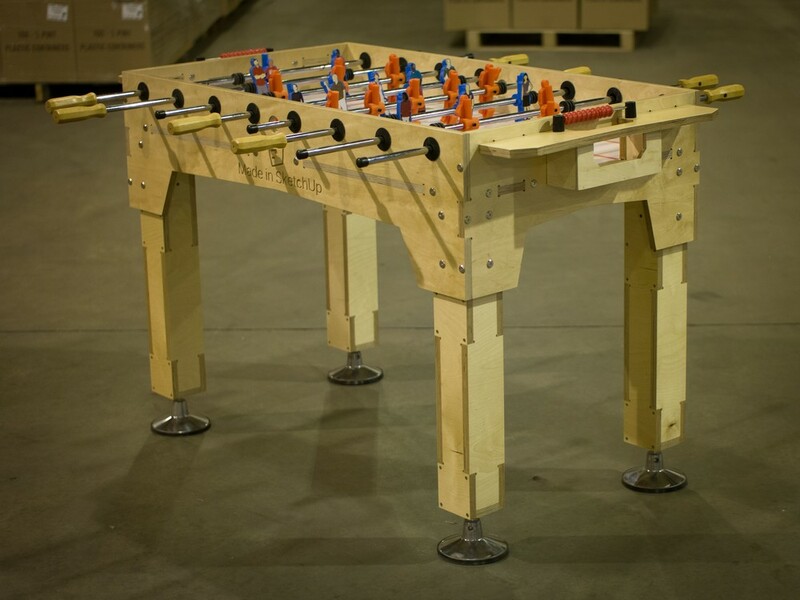 He designed this foosball table from scratch. Combing graphic design, hardware, 3D printed players and CNC cut wood demonstrates how multiple diciplines can be brought together using digital fabrication tools. This video shows the first time Eric brought together all of the parts for his 3D printed and CNC milled foosball table. Using digital fabrication he was able to ensure that all of the parts fit together the first time. Eric designed this 6' tall rocket out of sign material for a trade show. Check out the entire installation here. Eric was tasked with making a huge model of DC. He created this 4x8' model of downtown DC that featured 3D printed and CNC milled buildings along with lights so students could learn where the buildings are located. Eric was asked to assist in building a repeatable rocket rig for a science class. Students needed a repeatable rocket launcher so they could design, build and test their own rockets. Click on each picture to learn more. Before being a "maker" Eric was a "breaker". As a child his intense interest for the way things work lead to many disassembled home appliances to the dismay of his parents. Eventually he started to learn to put things back together. Eric worked for many years designing kitchens and furniture in high end woodworking shops. As his designs became more well known he opened his own fabrication shop that features advanced digital tools such as 3D printers, 3 and 5 axis CNC machines and 3D scanners. Most of Eric's projects are a-typical. 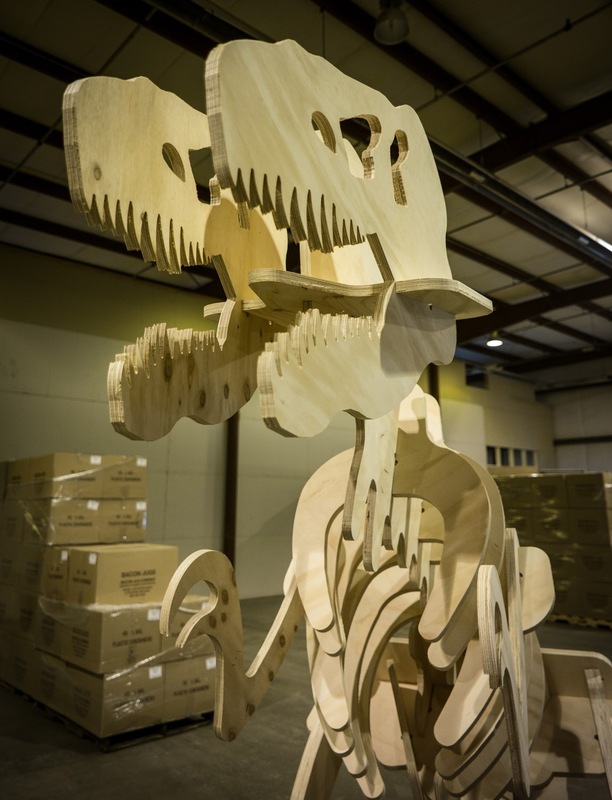 These include CNC cut houses made out of plywood, large geodesic domes made of PVC, 9' tall dinosaurs and foosball tables. Eric also works with other shops to bring his designs to reality. Working closely with electronics companies, 3D printer makers and software vendors has allowed him to create some unique and custom projects. Some of the most fun days for Eric are on site builds and assembly days in the shop. When he's working with a group of people for a build you'll always see smiles and high fives. Eric is an experienced public speaker. For years he's hosted seminars both large and small. He has taught live classes at maker spaces across the country. In these classes students learn to build something and then go right out into the shop and build it. He also has taught at trade shows and large format seminars. Eric is currently on year four of a five year teaching tour for Kitchen And Bath Design News. On these tours he routinely fills rooms of 80-120 people. 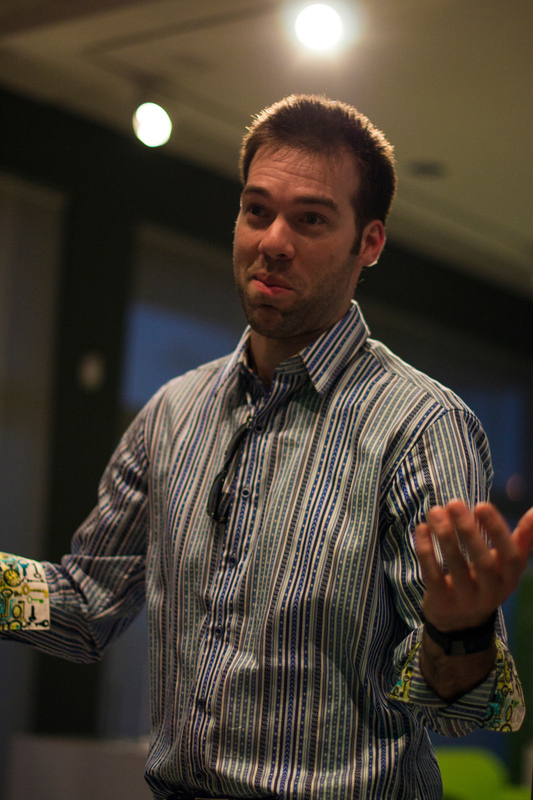 Eric covers technical topics in a way that's energetic, fun, informative and smile inducing. Eric also has experience on camera. Below are a just a few clips of his on camera appearances. Eric writes for Make Magazine and Kitchen & Bath Design News. Eric is an active columnist in Kitchen and Bath Design News. For years Eric has covered design technology and how it affects the design industry. You can read his articles quarterly in the print or digital edition or by using the link below. Eric also maintains a blog at his companies' website. There he covers everything from design technology, digital fabrication, SketchUp, and sometimes times things that are completely irreverent. You can read his posts by using the link below. Eric is also a writer for Make Magazine. He posts articles about making and building, usually related to the latest project he's done. Eric's company SketchThis.NET has developed and launched a kitchen design plugin for SketchUp. This plugin is a cloud service that plugs directly into SketchUp and provides a rich catalog of cabinetry and interior components. Designing kitchens and interiors used to take hours; this plugin can do complex jobs in minutes. 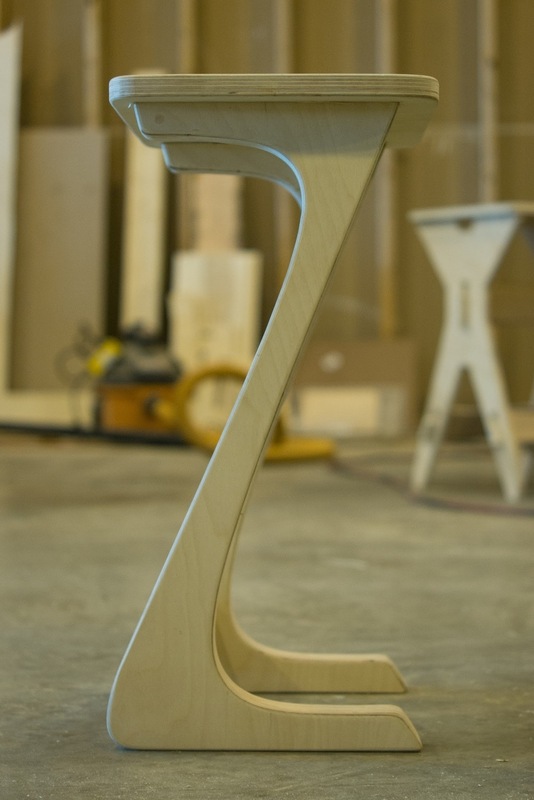 Digitally Fabbed is a company that designs and builds CNC cut furniture. Designs are typically either Eric's designs or items from OpenDesk or other open source designers. Digitally Fabbed designs, mills and finishes each piece in house.